(Left) Electrons transiting the 80 mm long metamaterial structure generate high power microwaves. (Right) Photo of the beam line at the Argonne Wakefield Accelerator. We have designed, built and tested a new type of accelerator structure that promises to make future accelerators more attractive by being smaller and cheaper. The accelerator uses a periodic metallic metamaterial structure in the shape of a stack of ​“wagon wheel” discs to control the microwaves generated in the acceleration process. The critical test of the new concept occurred at Argonne National Laboratory’s Wakefield Accelerator facility. 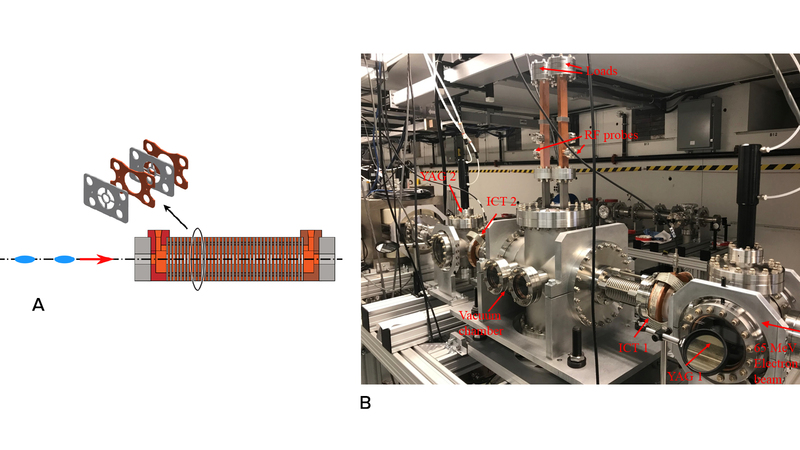 These results demonstrate the unique features of metamaterial structures that are very attractive for future high-gradient wakefield accelerators, including two-beam and collinear accelerators. In the test, a beam of electrons passed through the hollow central hubs of the wagon wheel discs generating a nanoseconds-long pulse of 80 MW of microwave power, in very good agreement with advanced computer simulations. A future test is planned to achieve output power levels in the gigawatt range. Advantages include the high shunt impedance for high power generation and high-gradient acceleration, the simple and rugged structure, and a large parameter space for optimization. This research was supported by the U.S. Department of Energy, Office of Science, Office of High Energy Physics under Award No. DE-SC0015566. The work at the Argonne Wakefield Accelerator Facility is funded through the U.S. Department of Energy, Office of Science under Contract No. DE-AC02-06CH11357. Xueying Lu, Michael A. Shapiro, Ivan Mastovsky, Richard J. Temkin, Manoel Conde, John G. Power, Jiahang Shao, Eric E. Wisniewski, and Chunguang Jing. ​“Generation of high-power, reversed-Cherenkov wakefield radiation in a metamaterial structure,” Phys. Rev. Lett., Vol. 122, 014801 (2019). Manoel leads the group that operates the Argonne Wakefield Accelerator facility (AWA). Jiahang Shao is a member of the Argonne Wakefield Accelerator facility (AWA). He works on structure R&D for beam-driven wakefield acceleration as well as high brightness cathode research.